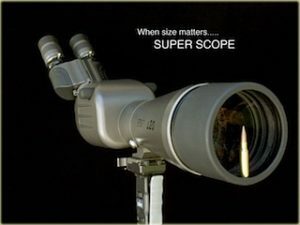 The prestigious John Rigby Company has introduced the pen-ultimate spotting scope for serious target and long-range varmint hunting shooters. Rigby’s Geoff Miller, a long-time devotee of long-range precision shooting, explained that the “glass” available to civilians in the shooting sports could be greatly improved. Geoff should know as he has spent over 30 years in the aerospace industry and has vast experience in a wide array of precision optical devices. Our scope arrived packed in a beautiful and rugged carrying case properly partitioned for each element of this scope. There are three basic items which must be assembled for use: the main body of the scope, the binocular section and the two eyepieces. Unpacking and assembly takes less than a minute. Once the interpupillary distance is established (that’s the distance between your eyes) and the individual eye focus is established the scope is set for use. The optical quality of this instrument is without peer in my over 30 years of using spotting scopes. Nothing I have ever used can compare to the clarity, brightness and ease of use that this instrument delivers.